As prisoner #1795, Steyer shares 27 freeze-frame visions in chronological order that contrast ten years of Nazi terror with individual religious determination and hope. The artist chose to use bright colors, perhaps reflecting the hope and optimistic yearning that infused his Christian faith. Includes commentary on history of Jehovah’s Witnesses in Nazi Germany. Audio clip and transcript of Magdalena Kusserow Reuter. The Kusserow family were Jehovah’s Witnesses in Germany and refused to conform to the Nazi regime, resulting in the arrests of several members of the family. Magdalena spent six months in a juvenile prison, refused to sign a declaration renouncing her beliefs, and was sent to Ravensbrück from 1942-1945. 123 oral histories of Jehovah's Witnesses who survived Nazi persecution, including Max Liebster and Simone Liebster. On October 1, 2009, the Museum hosted a special program highlighting the persecution of Jehovah’s Witnesses. Video of interview with Hermine Liska from Austria. "We Honor and Remember Jehovah's Witness Victims of the Nazi Era"
On October 5, 2006, the Museum offered a full day of programs about Jehovah’s Witnesses. Videos of interviews with Magdalena Kusserow Reuter and Franz Wohlfahrt. Testimony of Robert Wagemann, Jehovah’s Witness survivor. Shortly before his birth in 1937, Robert’s mother was imprisoned briefly for distributing religious materials. Robert’s hip was injured during delivery, leaving him with a disability. When Robert was five years old, he was ordered to report for a physical. His mother overheard staff comments about putting Robert “to sleep.” Fearing they intended to kill him, Robert’s mother grabbed him and ran from the clinic. Nazi physicians had begun systematic killing of those they deemed physically and mentally disabled in the fall of 1939. 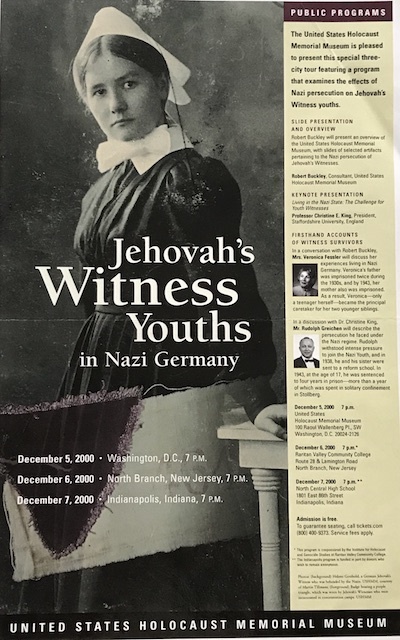 Audio from public program examining the effects of Nazi persecution on Jehovah’s Witness youths held at United States Holocaust Memorial Museum on December 5, 2000. Includes keynote presentation “Living in the Nazi State: The Challenge for Youth Witnesses” by Professor Christine E. King, and firsthand testimony from survivors Veronica Fessler and Rudolf Graichen. Testimony of Simone Arnold Liebster.